Slowly but surely, the sun starts to shine. The blowing wind and the pounding of the wave complete the scenery of Teleng Ria Beach. Teleng Ria beach is a bay. The beach was placed between two high plain which is part of lime South mountain range, start from Kidul mountain through Trenggalek. This beach was face to Indonesian ocean. Although this beach shined with an intense sunshine, the air feels cool and chilly just like an air at the mountain. The wave is quite small, and this is good for the surfer, especially for the beginner. 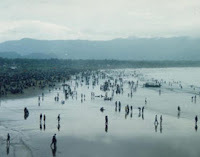 Between June – August, Teleng Ria beach become the place for jellyfish to migrate. "Usually between June – August, there are lot of purple jellyfish show in this beach," said Hamdoko Coordinator of Baywatch (Teleng Ria beach guard). "More tourists came here than last year. Last year many seller only got Rp 50,000, but now their income is increase," said food and beverage seller around the beach. The same thing is also happen with kusir dokar (horse drwan buggy), Visitors who rent dokar for traveling around the beach is increase than the last year. "The tourist who rent my dokar is much more than last year. I almost can not take a break for a while," said the horseman with his strong Java accent. Since September 15th 2008, Teleng Ria Beach management was taken by PT. EL JOHN Tirta Emas Pariwisata officially. With private management, Teleng Ria Beach wished to be better and can give positive contribution for Pacitan in tourism. To make this beach more luxury, several facilities that already exist will be fenced. There are also facilities increment around Teleng Ria Beach, such as art plaza, plaza for play children, and plaza kuliner. "We’re going to build playground for children which is educative and make children more creative", said Ardy. Development and construction Teleng Ria beach region also involve people of Pacitan, especially people around the Teleng Ria beach. "We want people feel the benefits of the place that we manage, and also raise up the people properity”. One of the real act is EL JOHN asking the fishermans to get more income through rent their boat for the visitor of Talang Ria Beach. "At certain season fisherman not go to the sea, so we give them chance to rent their boat. The sharing income is 70 percent for the fisherman and 30 percent for the management", said Ardy. Although the wave not big, Teleng Ria Beach is quite representative for surfing. The wave is suitable for the beginner. "Many people who want to learn how to surf came to this beach, such as Semarang and other city near Pacitan", said Choirul, the manager of Pacitan Surfing Club. 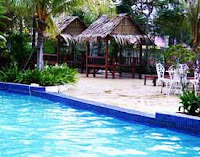 Teleng Ria beach is become one of the favorite place for foreign tourists who want to enjoy the pleasure of beach. "The foreign tourist who come to this beach is not too much, but they happy because this beach is not too crowded", said Choirul. Another attract thing why many foreign surfer choose Teleng Ria is because the beach ambience still quite. "Foreign tourist who came in here is from Australia and Switzerland. They happy came here because it’ quite doesn’t like Bali. So. They don’t have to compete to get the wave". Teleng Ria beach was located in Pacitan, about 3 Km from downtown. Only take 10 minutes to Teleng Ria beach from the town square. 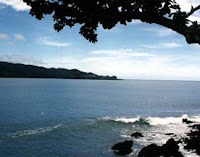 Pacitan was located in Java South Beach and border on central Java province. You can reach the beach faster from Yogyakarta (Only takes 3 hours trip). The road from Yogyakarta to Pacitan is very good but not to wide, fit for two cars and two ways. If you have a plan to leave from Yogyakarta, it takes 3 hours trip to reach the beach utilize Jogjakarta-Pacitan travel. It costs around Rp 40,000 - Rp 50,000. Another alternative is utilize bus, start from the Pacitan bus station, you pay Rp 12,000/man then take angkot (public transportation) to Prengkuku which costs Rp 2,000/man. Enjoy The luxury of Teleng Ria Beach.